14 Jul ULTIMATE TREE STANDS!!! What would your ultimate tree stand look like? Deer hunters have certainly spent a lot of time swaying in the trees or sweating in bug infested ground blinds. What would make your stand the BEST!!! The first tree stand I ever climbed was rotten. It was in an old forked oak tree on the eastern shore of Maryland. The woods were full of old stands but this one was near the deer trails and sign. The third step pulled out of the tree. This old 2×4 stand was crappy and unsafe when it was new. Somehow, I managed to get to the deck and sat down on the old bench. Scrawled onto the deck were the names of other crazy hunters that managed the climb. I spent the afternoon in the tree swatting mosquitos, swaying and creaking, and being most uncomfortable. No deer, no comfort, unsafe, and a waste of time. This old stand certainly taught me what I don’t like about tree stands. There are 5 things to consider when making a stand. 1.) Safety- Pick a safe stand location. If you are using a tree, make sure the tree is solid. Never use a damaged or dead tree. Ground blinds need to be away from insects, bee’s nests, snakes, and poisonous plants. ALWAYS wear a safety strap when climbing a tree. 2.) Placement- Consider the wind, background, size of the tree, and shot potential. I often look for multiple tree together to allow me additional cover. Deer do look up. Think about that view. Your stand needs to be discreet and unobtrusive. Remember that you are in the deer’s living room. They will notice every change. Have different stands for different weather and pressure situations. Do not overhunt one stand. 3.) Comfort- Stand hunting requires great patience. You need to remain quiet and still. If you are not comfortable, swatting flies, and constantly fidgeting, the deer will see you. Wear appropriate clothing, use a Thermocell for the insects, have a cushion to sit on. Allow the safety strap to support you. Adjust it so you can lean away from the tree to shoot if needed. It can also cradle you when resting. Keep your weapon, binos, and needed gear close using hooks and harnesses. 4.) Camouflage- Deer do not see color but they do see reflected light and movement. Years ago, the first camo clothes were just patterns of colors. Flannel shirts, coats, hats, and pants. Use earth tones and keep the patterns. It is the patterns that allow you to blend into the background. Pick a tree that is big enough to hide your body. Otherwise you look more obvious. If you cut branches, cut them away from your stand. Deer notice every pruned branch. Green branches die quickly and then stand out. Use fake plants if you need them to stay green. 5.) Access- Getting to and from your stand takes planning. 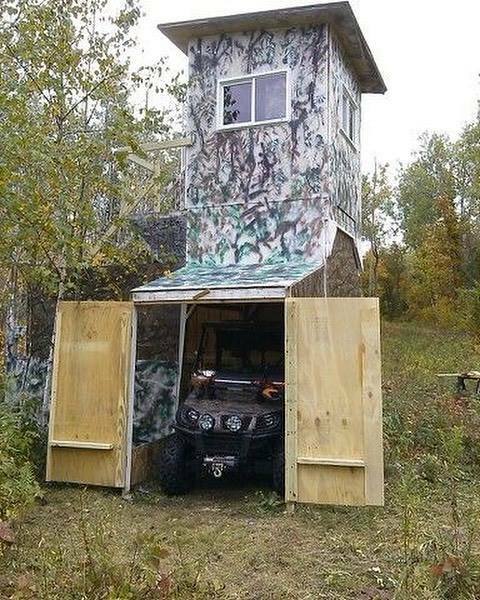 You do not want to drive the deer away while getting to your hide. Consider prevailing winds and where bedding and feeding areas are. Deer are generally critters of edges. Avoid walking along these areas. You will leave scent and be seen. The rest is just window dressing. You can certainly tune your stand however you want. You can also have the most comfortable stand in the forest, but it is worthless if it is in the wrong place. One hunting friend had a Condo Stand that was full of comfort features. He had heaters, grills, office chairs, curtains, and a coffee pot. He even carpeted the floor. Solar charging panels kept a battery charged for his power needs. He had placed truck mirrors all around the stand to look in all directions. I do not know of any deer that were ever shot from the Condo Stand, but it was comfy. Portable stands allow for flexibility and safe the trees. Climbers and ladders work well as a stable platform to spend the day. 12-16 feet is plenty high. If you get higher, your shooting window will decrease at the sharper angles. Map your hunting area. Update the observations each time you scout or hunt the area. Hang the map on a wall and examine it often. You will notice patterns. This will help you to plan each hunt. Depending upon how big your area is, have several stands to use. Wind is critical and the one thing that will allow the deer to bust you most often. Deer also learn to avoid overhunted stands. If you plan to cut shooting lanes, do so early so the deer get accustomed to any changes in their living space. Food plots can be helpful as well as mineral licks. Keep in mind the seasons when these will be used. Antler enhancement blocks, powders, and supplements work best before the season starts. The deer will fall into a pattern early and may still be in the pattern early in bow season. Placing these supplements out during deer season is unnecessary and will often stay unused until the spring. Baiting is not as sporting as hunting but is used to decrease high deer populations. Corn, sugar beets, apples, and other foods are legal in some states. The corn is often unhealthy for the deer. Many deer starve with full bellies of bloated dry corn. Trophy bucks usually hit these bait stations at night. Ethical, sporting, and safe deer hunting is what most true hunters strive for. Stands are a great way to improve your hunting odds. Tree stands often become an intimate part of your hunting memories. These hot spots often get named and have special stories that last for generations. Take the time to prepare and place your stand in the right place to serve your needs. For more Montana Grant, you can hunt him at www.montanagrantfishing.com.